The Arduino WebSocket we used limits the size of packet we can send. We are unable to receive entire 512 bytes Block, even if we divided it into 3, from the WebSocket. Thus we are going to change the protocol so we are sending each Data item one-by-one. If we send "GET0", we receive N = <Data Block Number>. is unsigned 32 bit integer ranging from "N = 1" to "N = 4294967295"
Of course it doesn't get that big. In the source code from Data Log Code posting, SD_BASE_BLOCK (1024) is equal to 0. <time stamp> uses sec part from POSIX time_t. Because we don't use the millisecond part, we need to *1000. "T = 4294967295". Of course it will be hard to see this number in your lifetime. "D=-99.999": termination. Data Block has finished. n is equal to Channel number which is between 0 and 7, and there is no reply. When you send "DI" it replies with "bbbbbbbb". b is equal to each input channel and it is either '0' or '1'. When you send "AIn" it replies with "+dd.ddd". n is equal to channel number which is between 0 and 7, and "+dd.ddd" ranges from -10.000 to +10.000. Below I am only excerpting codes related to uploading. Refer to the link at the bottom for entire code. // Store the currently logging Block into SD. // We might lose packets that ADAM-4017 is receiving. 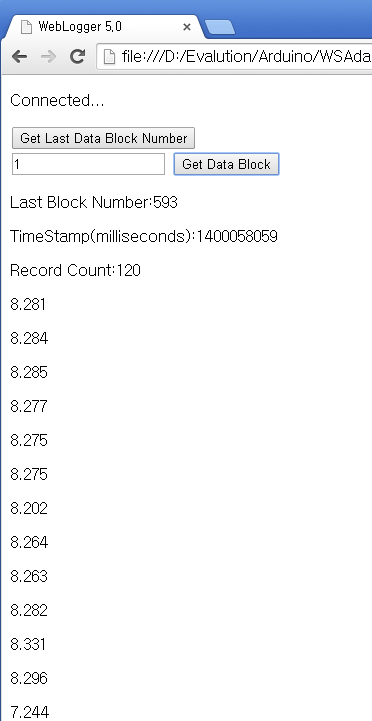 // Reload the block that we have stored.